Syllabus of the Online Course (Subject): Islamic Banking and Finance System. Description of the Online Course: Islamic Banking and Finance. Under these two premises are re-defining the banks role in Islamic Economics. Of course; an Islamic Bank must comply with the Sharia. An Islamic Bank cannot be a single lender who is not involved in the business, the Islamic Bank should take a more active role, should be a financial partner, the Islamic Bank assumes the risks of the company and therefore have a part of the business ownership. “The principles of Islamic Finance may represent a possible solution to the global financial crisis.” (Osservatore Romano, March 2009). If for whatever reason, any of the parties achieved a benefit derived from the Riba then has an obligation to destine it to charity (Zakat). Under the principles of Islamic Economics, the objective of Islamic Banking is, besides making money, contribute to the wealth distribution in a fair and equitable way, not on speculation. 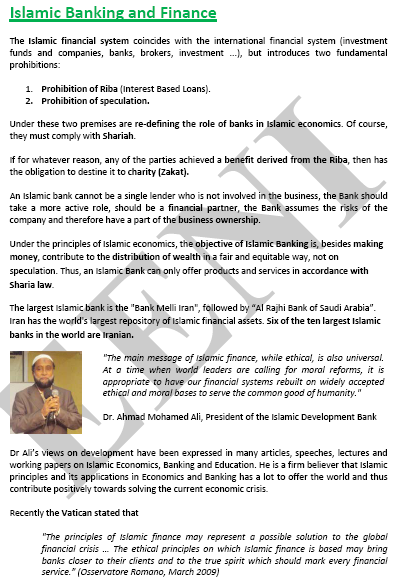 Thus, an Islamic Bank can only offer products and services in accordance with the Sharia law. Iran has the world's largest repository of Islamic financial asset. The International Bank of Kuwait offers services of the Islamic Banking.